This is the graphics, which I currently useing in my might-be game. 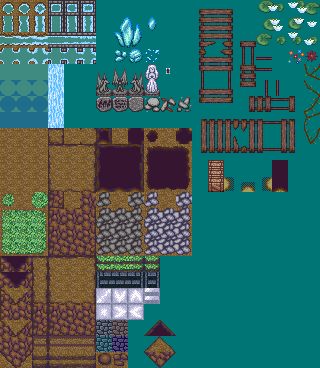 It's include tileset for a brown cave and a pack of characters with faces. I've redrawn my previous pack and added some new. All heroes have 8 face expressions and a image for menu or battle screen. PS. Big thanks to diamonddmgirl. Yes, I like your art very much. I can add you as a collaborator or remove queen and aristocrates if you like. When I start doing my own game I realized that faces look prettier with the shoulders and the characters are more unique this way, so I've reviewed all faces and corrected the charsets as well (some of them had problems with movements of hands and legs). You're right that these three are the main characters, but you ought to choose only one of them to play. Yan/Lyuba is another story. An attempt to make a game with a choise of gender a prifession for main character (right now there is only intro). This is turning into quite the extensive collection - nice addition! Created some handymen sprites for Stendhal based on your work. Thank you very much. Hello !, so i dont understand much about the licenses, they still confuse to me, and i have to ask: If i credit your work correctly, i can use this characters and tileset in my own commercial project ? Hello, IndieBr. You're right, you can use this pack of graphics in your commercial project if you mention me in credits. Thanks in advance.